Includes 3 to 4 year olds enrolled in public or private school. According to the Urban Child Institute, 80 percent of human brain development occurs in the first three years of life. Parenting Magazine reports that between three and five years of life, a child’s vocabulary typically grows from 900 to 2,500 words. Exposure to preschool education promotes language and cognitive skills, and helps promote social and emotional development. 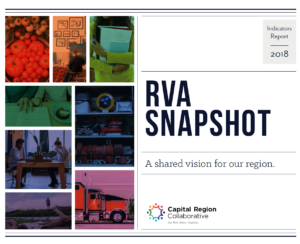 In the Richmond Region, the percent of 3 to 4 year old children enrolled in preschool has increased from 45.3% in 2014 to 46.9% in 2016.